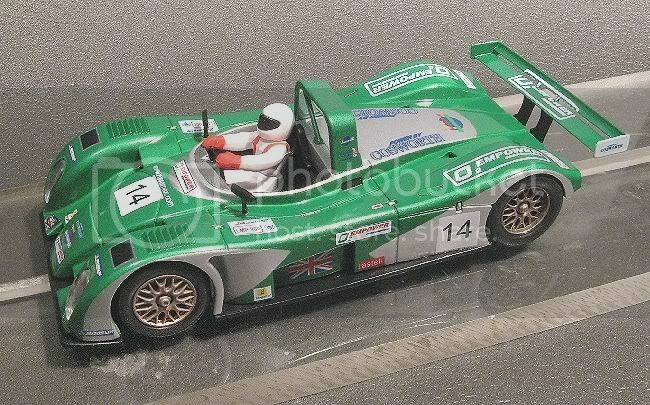 Reynard Motorsport was founded by Adrian Reynard in 1973 and was known then as Sabre Automotive. They participated in Formula Ford, Formula 3, Formula 3000 and Champ car to name a few. Their involvement also stretched outside the scope of motor sport and in latter times they were involved in developing and producing airliner seats for the Virgin Airline company. The Cart car market was their bread and butter but a rule change saw markets drift away. Reynard also helped BAR in their early days and acquired Riley and Scott in 1999. After a financially troubled period the fatal blow came in 2002 when they launched an aborted float on the New York stock exchange. Declared bankrupt, Reynard was divided up and the rest was history. This model is the NASAMAX entered 01Q-01 and its uniqueness was the fuel supplied. It ran with 100% bio ethanol. NASAMAX and ASTEK developed the fuel and the delivery system, using a blanket of nitrogen in the fuel tank to prevent and suppress fire. Ironically, the car retired after almost nine hours racing after catching fire!! So this is the end of one of motor sports more successful marques with achievements spanning three decades. How have Spirit risen to the challenge? As you may be aware, I have already checked out the 936 and found it cosmetically wanting, even though it is a potential winner in its motor class. This model, on the other hand, is well made and decorated. Tampo is crisp and clear and detail is above the 'acceptable' mark. It shares a motor with the 936 in the SX-01 and here the confusion starts! This model is marked on the insert as having a 24,000 rpm motor whereas the SX-01 is designated a 20,000 rpm motor on Spirits web site?? Not to worry. Having already driven it I can assure you that it is the lesser of the two. Still quick but not blistering! So, are there going to be any shortcomings? well, actually, yes! But with this model it’s the mechanical side which causes the heart ache but before you despair, I will tell you now that there are no irreversible faults. Simple things and silly things side by side, which you wouldn’t expect to find amongst market leaders. So, where to start. Let’s kick off with an old perennial. A lost wheel and alloy swarf - could put lesser racers off? I bought the model at Red Racer Hobbies (nothing wrong so far) and decided to run a few laps on their banked and sweeping six lane Carrera track. 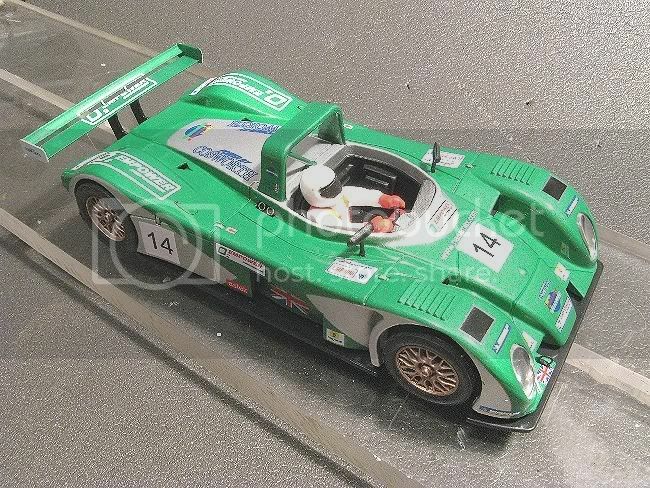 Right from the off it sounded like an early SCX Audi R8, body rattles and a noisy gear!! The model was going well SOOB and my first thoughts were, a bit of gear paste and some super glue on the back of the rattly bits. Just when I was settling in on some good laps the left rear wheel fell off. The model did have a little judder on hard acceleration but not having Doctor Phil’s medical bag at hand I was putting up with it. 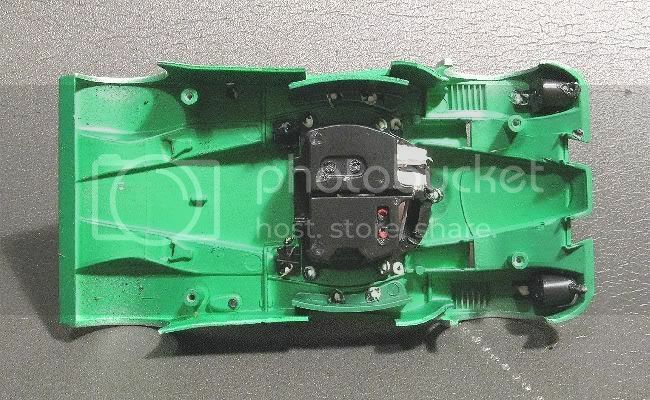 I don’t know that the judder caused the wheel to drop off, but seeing as this is not a recent model I can suspect that maybe there could be some shrinkage in the plastic parts? Anyhow, the wheel was well and truly off and it was a loose fit to boot! A check for hub cracks revealed nothing except for the model’s brake disc dropping out of the back of the wheel! It turns out that all the discs are installed loose! So with road test over, I left the model until my return home and on the next quiet Sunday afternoon, with the sun beating down, I decided to give the old girl a once over to bring it up to race standard. The following sequence of events prompted me to do a retro review! 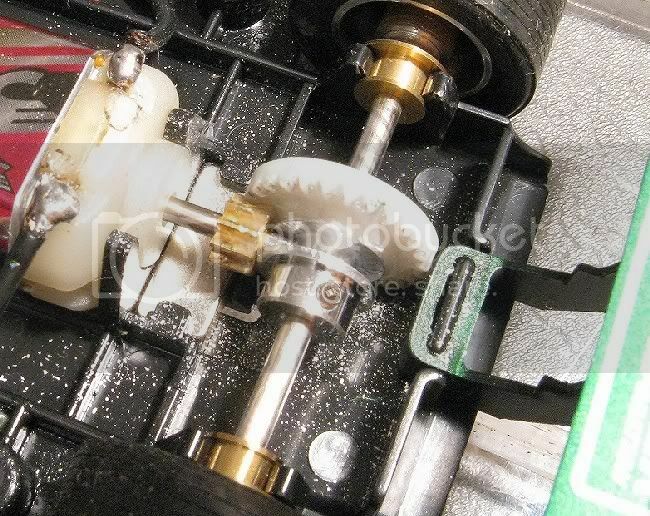 I took the top off the model and the cause of the gear noise was immediately recognisable. Like its stable mate the BMW 2002, this model has an alloy hubbed contrate. And, also like its stable mate, the gear was dry assembled. The noise I had been hearing was not a bad mesh sound. It was the sound of the motor shaft churning its way through the alloy hub!! But unlike the BMW and thanks to a loose wheel, I had caught this one in time and was able to salvage it. The extent of the damage, but not fatal! 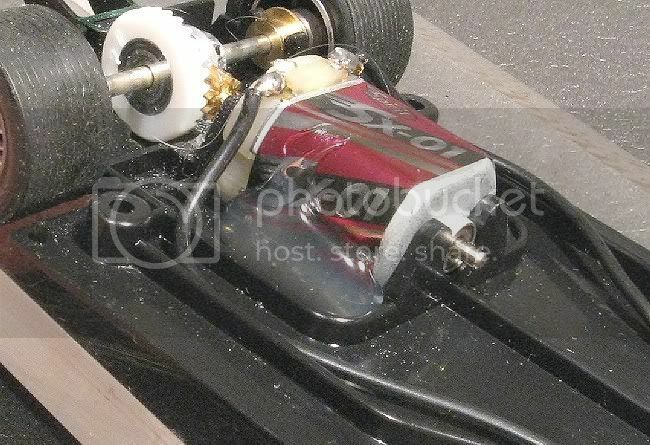 The axle was popped out and the motor removed. 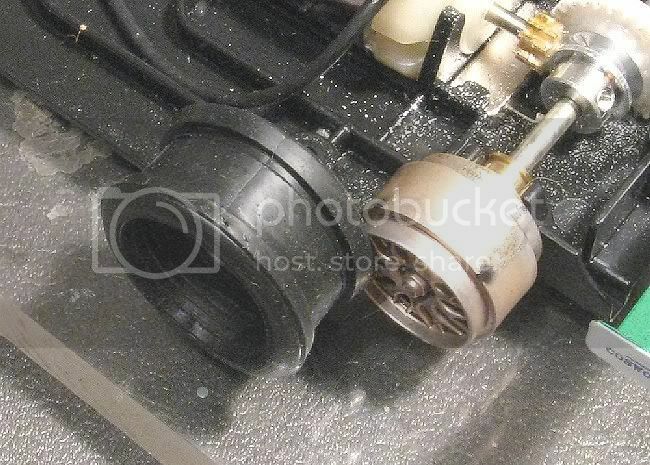 The axle was checked for damage and a thin sleeve of aluminium was removed from the spigot end of the motor armature! I checked the other rear wheel and that too was loose. 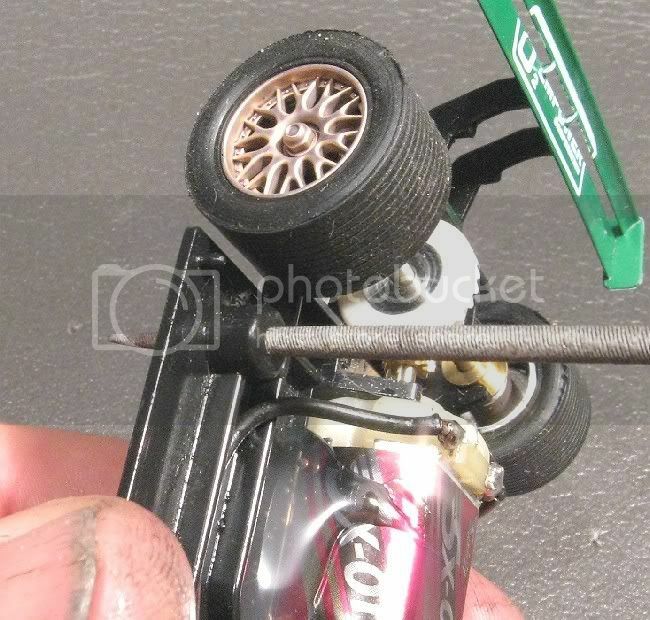 So both rear wheels had the superglue treatment while the axle was out. Whilst apart, I noticed the ends of the rear axle were ‘rough hewn’. They have been sliced off a length of wire and not turned off or radially sawn. This would be an essential check as the process leaves the ends of the axle eccentric. The rear was reassembled and a drop of Vaseline was applied to the gears. Problem one solved. The next thing I went for was loose components in the body or on the chassis. It didn’t take long to find what I was looking for. Both headlight lenses are loose in the body. One more than the other. The problem here is that when the light parts had been heat welded inside the model, the headlight bodies weren’t clamping the light lenses to the body shell, allowing them to move. The right hand lamp is attached at the top only! On one side the heat weld had been excessive and one end of the lamp assembly was not attached to the shell at all! A drop of PVA glue was applied to these and left to set. I avoided super glue as there is a risk of the clear lenses clouding over if the glue comes anywhere near them. Even the fumes given off can be detrimental! Next up was to check out the primary drive components. The motor was loose in its mounts, not a lot, but enough to cause the model to judder in a non magnet situation. This was hot glued in. Same rules applied here as to previous models, make sure the mating surfaces are clean and oil (and aluminium) free. Next, ensure the hot glue gun IS hot! The best test is leaving it to heat up ‘til the glue does not ‘string’ after use. I.e. When removing the gun from the job, there isn’t a long string of glue in its wake. 'Stringing' would tell me the glue wasn't hot enough and would surely detach at a critical moment in a race. 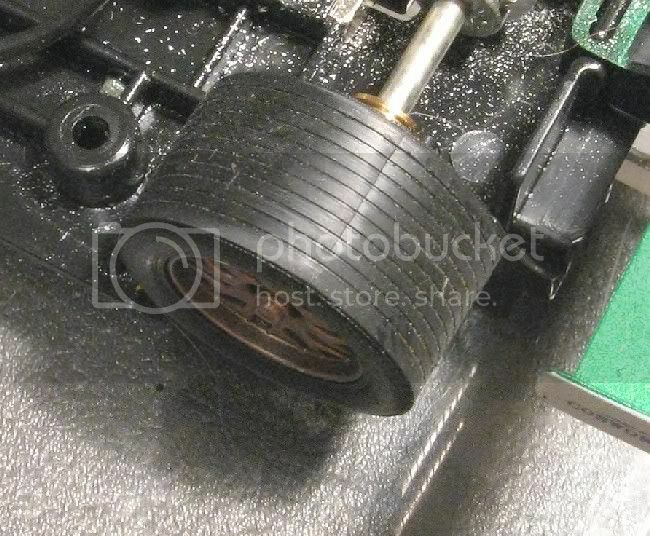 So, with the motor NEATLY glued in place the next check was the wheels and tyres. Mmmmmmmm? Both rear wheels are eccentric, not by much but they still are. Both rear wheels run out by about a millimetre and with the rear tyres also not being the best moulding, a tyre in the wrong position on a hub could leave the tyre surface quite badly eccentric. In this case I rotated the tyres until the eccentricity was at a minimum, almost corrected! I could quite easily have lost 2 mm off the rolling diameter If I had tried to sand the fault out. Instead, a light sanding will finish the job. The fronts had their own issues too but they will get a chamfering and truing. Inverted tyre goes pear shaped at weak point? The tyre compound is quite soft, almost handy! So they will be staying on to prove themselves. One problem there is with them is that there is a moulding fault line across the inside and outside of the tyre. Not too noticeable when the tyre is in place, but when one is removed and inverted, it changes to a pear shape instead of a ring! The fault line lets its presence be known as a straight recess in the tyre tread from side to side. Inverting the tyre shows this to appear on the inside in the same position? Cartrix tyres also have this characteristic and most of us know Cartrix tyres as have a habit of splitting laterally or turning rock hard over night!! Next up, the magnet is a medium bar type mounted between the motor and rear axle. Strong enough to put the model on the threshold of holding itself to a piece of inverted Scalextric track. The rear wing clips into the chassis. This will allow it to be removed if the racer chooses to even though the body will need to be removed first. The body screws are good too. A medium Phillips or posidrive will fit the screws and the rears are a good length. The fronts are shorter but still long enough if you race with the body loose. Before the body was refitted I enlarged the screw holes through the chassis to minimise the risk of screw threads catching on the chassis while in motion. This was done by lightly turning a modellers round file anticlockwise in the hole several times. The guide is stiff which is a good starting point. It will need a little attention before it is race ready. If you deslot for any number of reasons the last thing you want is the marshall to fumble your car because the guide is stuck to one side or other! 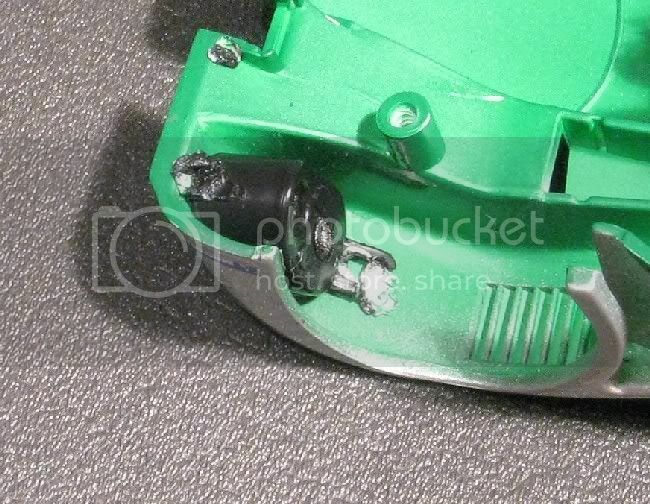 Also, when refitting the body, watch out for the lead wires again. The wires can get trapped under the body if not in their little clips. Also be sure the lead wires sit inside the central area of the body nose cone. One side or the other will see the guide once again become stiff, giving the marshalls more strife. Before the top goes on, just ensure the rear axle is central between the bearings and not binding on either side. If they are binding, simply move the contrate across a little. 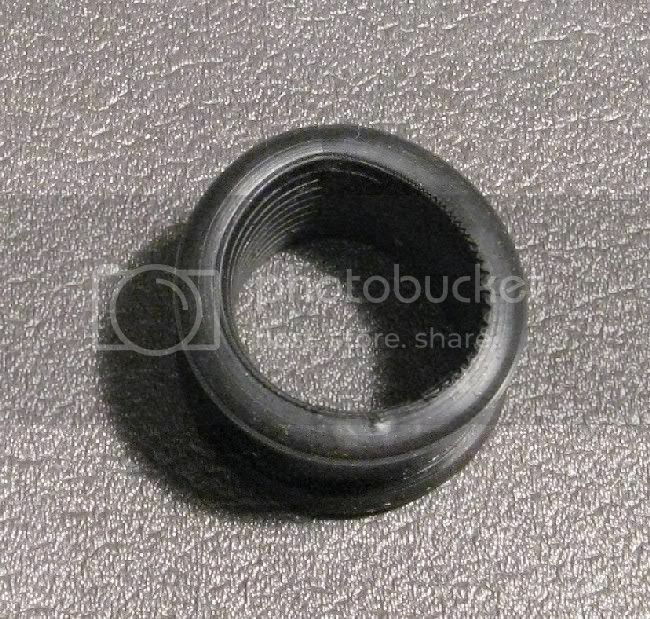 The bearings are an exceptional fit and hold the rear axle firmly in place. I couldn’t be anything but impressed with the model’s ground clearance. As low as you like to the track, but if you are plastic track racing you may need to watch out for this on track joins at elevation changes. 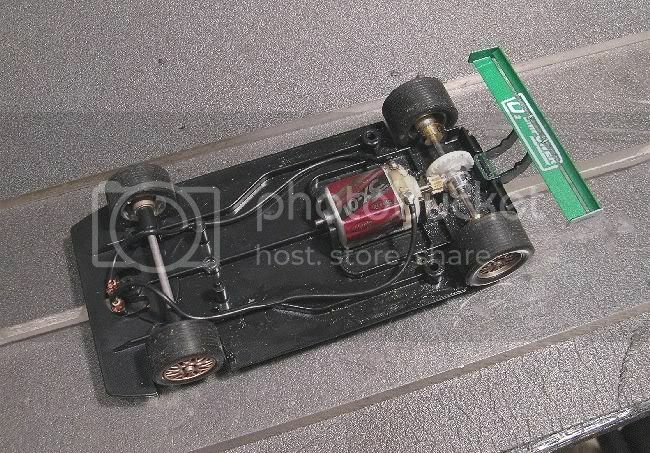 Lastly, the model box advertises the motor as rated at 24,000 rpm. Not sure why, because the SX – 01 motor is the same one as in the Porsche 936, which they advertise as 20,000 RPM. It certainly drives like a 20,000 rpm motor. Last up but first in this case is the track test. The model was run on a large six lane Carrera circuit with a number of banked corners. Apart from the transmission noise the model took off smartly and behaved impeccably for the duration of the test. A lot of fixed front wheel model dislike banked corners as when they enter banking, the front and rear axles run on different planes! With the rear of the model usually being dominant because of weight or a traction magnet it means the front inner wheel is pulled up in the air by the outer front following the track contour. In doing this the guide is also lifted part way out of the slot. This is often enough to see the model deslot readily if the corner is driven into too fast. On this model it wasn’t apparent and banked and flat corners alike drove well. Straight line speed was good too. Not a pocket rocket but also not a slouch. It will be interesting to pitch it against the Scaley and Fly equivalents. In all, a good track test with no hitches (except for the wheel detachment!) and no bad manners or surprises. The track was a little dusty from standing and this was accounted for during testing. Front axle width				62.0 m.m. Rear axle width					62.0 m.m. Rear wheel diameter				21.5 m.m. Progress					22.52 m.m. per motor rev. Rear tyre tread width				11.5 m.m. Guide thickness (median)			1.46 m.m. I am not convinced this model is made by the same people that make the 936 and the BMW! Why? They are so very different. 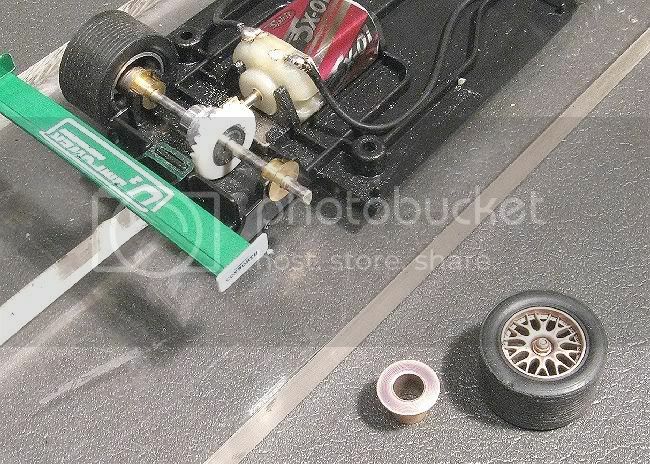 The Reynard doesn't have the front axle adjusters and the motor is an inline setup? It’s hard to believe the difference in build quality between this model and the Porsche 936. Once again, the Porsche is a potentially great competition model but the body finish is dire. This model is potentially a great racer and the body is fine?? And guess what? I’m looking forward to its first official race. Spirit have captured the LMP feel.